May 12 is “one of those days” on my calendar. Fifteen years ago today, my mother passed away. It was Mother’s Day then. My mother also was born on May 12. She was only 60 years-old when she died. I’m amazed by how quickly 15 years have transpired. So much in my life has changed, yet so much feels the same. As I’ve blogged before, my mother had a very fulfilling but challenging life. She and her family were war refugees; they lost everything they owned in a few hours. She and her siblings all died young, the results of long-term stress and malnutrition. My mother suffered from kidney failure and two bouts of cancer. Yet, she every day tried her best and put on a good face to the world. She was a very giving person, the life of the party when healthy, and had an insane work ethic when her body allowed for it. One of my favorite pictures of her is up top. We were in a rough part of Brooklyn then and were visiting the Brooklyn Botanical Gardens. 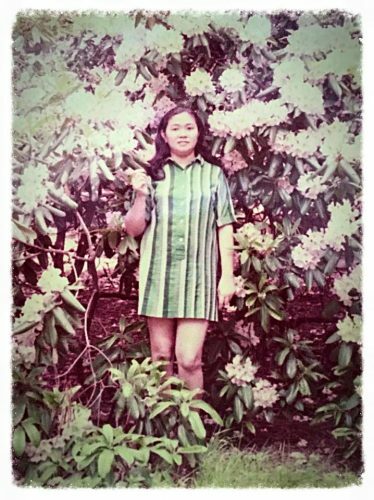 My mother loved being outside and she loved flowers. I remember that day well: a cold hot dog for lunch, my mother happy and healthy. My mother was frugal. She bought very little for herself. All of her clothing was from discount stores. Her most prized possessions were shoe boxes filled with our greeting cards to her over the decades, which she asked to be placed in her casket. Later today, I’ll be at 12 noon Mass. I’ve asked that it be celebrated for her. Catholics pray for the dead. We hope that they have found rest. I’ll be praying for my mother. I will pray that she is at rest and has found complete joy and peace.